NGOs in the Baltic Sea Region - das NGO-Ostseenetzwerk: BALTIC SEA NGO FORUM - Will Lithuania bring it to an end? The collaboration between people never was easy. It always seems to be better to take care for one's own fate, for the individual welfare, or the rivalry between people with similar interests. It surely is a much nicer feeling just to be able "using one's own power" towards other people, than to use time and engery for informing people, involving others, encourage those having less knowledge, or empower new people with young and fresh ideas. Sorry to say, but I have no other choice. 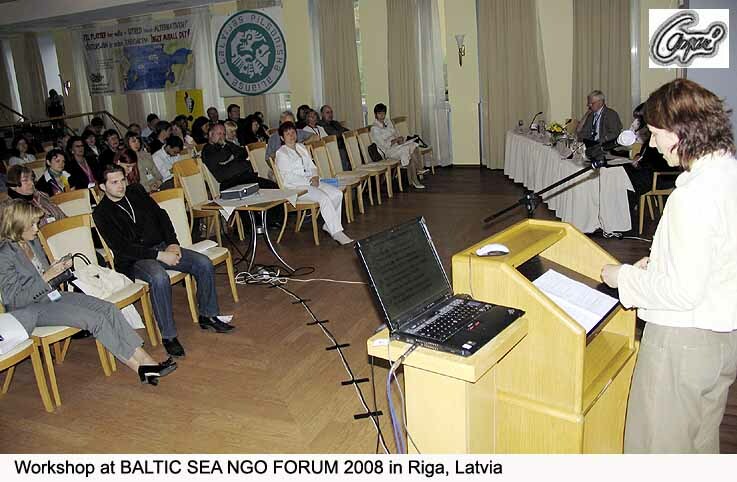 This so called BALTIC SEA NGO FORUM, which is going to happen in Vilnius at 16th and 17th of April 2010 (see announcement), has not much in common with previous successfull BALTIC SEA NGO FORA in other countries (see f.ex. BS NGO FORUM 2009 Denmark). Anyway, it may be the last ones of it kind: if organisations and intiatives, Citizen groups and action groups of Civil Society first will notice, that a conference is just organized to make a good image for the organisers, leave all the costs (international travel, accomodation, food) to be paid by participants, and use 0% energy on preparing proposals for a better support and concept for NGOs work in future - what sense it could have to join it? --- the Focal Points (national co-ordinators) had no chance to participate in the preparation of the NGO FORUM Vilnius. After months of quietness and absence of any network communication the Vilnius NGO Centre announced some weeks ago suddenly, that there will be no preparation meeting at all. Given Reason: Problems of financing. No alternatives were seriously discussed, attempts in getting help by international foundations working in Vilnius were not supported by Lithuanian NGO Centre. Only alternative was an virtual discussion of just two hours, partly by skype and partly by Email, organised at one Friday afternoon. Even there only Focal Points of 4 countries participated with proposals and comments. But nevertheless: as the Vilnius NGO Centre seems to have got an order by Lithuanian Foreign Ministry to organize an NGO FORUM "cheap, quiet and comfortable", all problems were left without any attempts for common solutions. The "we-have-no-money-for it"-argument was followed 100% by the leaders of the Vilnius NGO Centre, who by the way never participated in any of the previous meetings of the NGO-Networks meetings of its Consultative Committee (which means = all Focal Points together). It means, as there will be no chance for a preparation meeting of the NGO Networks Focal Points before the Vilnius conference, this seems to be the end also of the Baltic Sea NGO Network. Why to run a network and to attempt exchanging views, experiences, viewpoints and oppinions and fight for a common concept, if it is possible that someone (with no responsibility towards the others) suddently can come and just say: ok, I'll overtake, I don't need the others at all. Our ministry finances only the NGO Centre, but not the work of the NGO Baltic Sea Network." Those, who do not want to join this "game", are just crossed out of the list (see Webpage of Vilnius Conference). Previously national NGOs had to send proposals and ideas to Focal Points for to get a place as participant of a BALTIC SEA NGO FORUM. This time it will be just online-registration, and even for this registration form every person could write whatever comes to one's mind: true and false stories, self.manifestations, nice sounding stories, or extreme claims and statements - no one will have time to care about it. Without effect, just adding a person to the number of partipants (organizers expect "more than 300"). "Paper doesn't blush" - if you know what I mean. --- As we all know, it is not that easy to raise one's voice for NGOs interests. Who expects at all that critics towards single governmental institutions, actions for alternative lifestyle, fight against negative consequences of the globalisation of commercial interests, demonstrations against dangerous use of nuclear energy, insist in a social balance, or self confident fights for Human Rights or the Rights of Minorities? Who needs it? May be just those growing number of people who understand that its really important to take care also about the society in their own country, and the peaceful collaboration of Baltic Sea Countries. People who don't hesitate to mention "burning issues". Well, is this going to happen in Vilnius? After this surprising negative Lithuanian coordination I don't expect more than "a conference of many speeches". The opportunity given will be (and the majority of participants will be just Lithuanians): hold a speech yourselves! (but short!) A wellknown concept of those, who try to avoid that people from different countries (and none of them has English as mother tongue) notice their problems to be very similar. It is surely a misunderstanding that the longer the speech will be (and the Lithuanian president promised to attend at least the opening! ), the more important one's own organisation can feel. And what about the network? --- It is a clear misunderstanding of networking, using a network only in one direction: if needing help, everybody should join. But if others needs and requests need time and energy, than better to leave. If others have proposals, better not answer, or refuse. 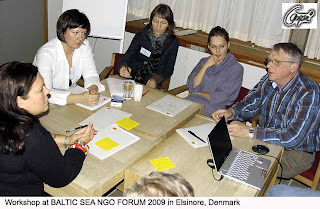 The real value of the so far existing Baltic Sea NGO Network was for the one part the inter-disciplinary work (to cooperate with people and experts from different fields, with different background), and for the other part the attempt to equal the opportunities for smaller as for bigger and stronger NGOs. As for representatives from NGOs with thousands of members, or single activists and individuals, all had a chance to join the network, to participate in workshops, in preparation meetings and in responsibilities. So far. The this years conference in Vilnius - which by the way will be very short, just some official speeches and one overnight stay - does not take this common values into account. And also another problematic structure is not understood: from the smaller and poorer countries view it could be understood as if all "people from the west" are just rich enough to cover costs and bring money to the poorer ones. But does money really mean everything? Are Civil Organisations in so called "rich countries" really so rich as they sometimes look like? What motivation have people in "older democracies" to be engaged in problems of society - are they perhaps just bored? The approach of the this years Vilnius conference seems to be: no, we do not invite you to our country; but IF you really want to come: pay everything by yourselves, and please leave even some money in our country. I am not sure whether this attitude will help to understand colleages and initiatives with possible similar interests better. A network which does not exchange views and oppinions, which never meets and - as a consequence - where even not the national coordinators know each other personally, this network is dead. Congratulations, Lithuania, this was done under your presidency! What is coming up? A "no-future-in Europe-generation"? Well, one could say: a conference is just a conference. Like many others. And the next ones will come. But the second upcoming trend is the growing dominance of what is called "EU Baltic Sea Strategy". 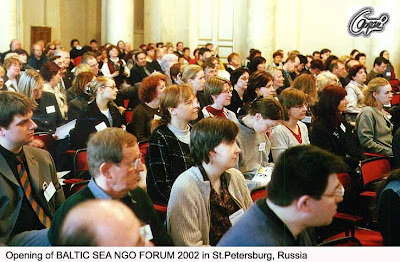 It never was easy to get a BALTIC SEA NGO FORUM financed. It never was easy to organise it in a way not being "just another conference". 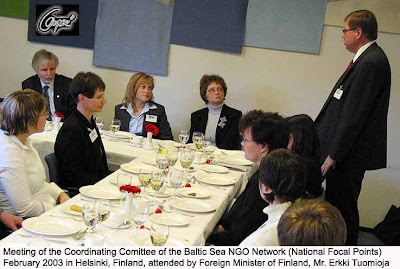 But as the institutions of the European Union never took the activities of the BALTIC SEA NGO NETWORK very serious, NGOs will have to look carefully what really affects their work. Inspite a lot nice speeches of EU-officials, there is a total lack of a common concept how to support Civil Society in the Baltic Sea Region. Regulations and rules are different in all of the countries, the procedure how to register and how to manage a NGO is different in all CBSS-countries, even in EU-memberstates. Therefore it will not be possible to found an organisation with members in all countries of the Council of Baltic Sea States (CBSS). For near future all active and interested people will depend on very shortminded project support, like "Swedes this year support Estonia", Finland may be finance contacts to Russia for a while, or Russian sponsors finance one NGO-conference in Latvia (just examples). Germany? Oh, sorry, Germany was left out already long time ago. For Germany partners around Baltic Sea seem not much more than business contacts. Isn't it quite symbolic that Germany has taken responsibility for the field of tourism in frame of the EU's Baltic Strategy? Once again Germans will be just asked to travel to other countries for leaving some money there. But different cultures? Languages? Traditions? Lifestyles? Minorities? Different views and problems in other countries? The official's interest in a cooperation with Germany seems to be as low as the German governments interest in the Baltic Sea Region. But such critical statements will be successfully avoided at the next Baltic Sea Conferences. As there will be no active Citizens left who work for independent and strong common representation of interests in the Baltic Sea Region. 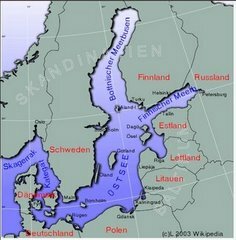 I am afraid the EUs Baltic Sea Strategy (see here) has totally forgot it, and the this years so called NGO FORUM will not be strong and powerful enough to change this tendency.